While on my spring break this past week I had the distinct pleasure to be able to work with some members of the United States Air Force Combat Weather Unit on an avalanche course here in Northwest Wyoming. 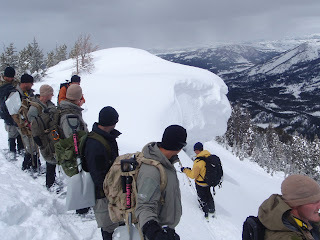 Jackson, and still experiencing “full” winter conditions through the last week of April, eight Air Force meteorologists assigned to a special unit at Hurlburt Field in Fort Walton, Florida made the trip to Jackson, WY for seven days of avalanche instruction. This was a Level I & II avalanche course that was coordinated through the American Avalanche Institute and co-instructed by myself and John Fitzgerald, along with Don Sharaf adding a lecture on Snow Hydrology. 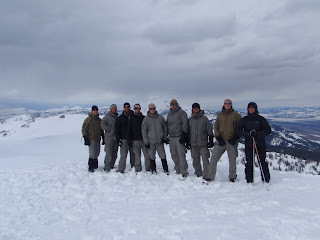 The purpose of this course was to teach these guys as much as we could about avalanches and snowpack stability evaluation, skills they need when operating in mountainous regions like the Hindu-Kush in Afghanistan & Pakistan. Pass and Togwotee Pass areas for seven days in a row. As you would expect from combat ready soldiers, they were up for the task and took on the lack of oxygen with gusto. By the end of the week they were pushing uphill with heavy packs at over 10,000-ft. as if they were back on the beach running through the sand rather than deep snow. 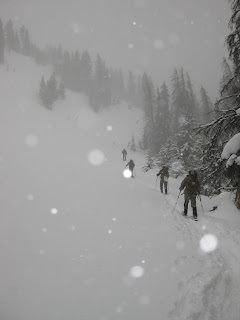 And deep it was, with new snowfall on several of the days, making for great powder skiing. And settled snowdepths in most place above 9,000-ft. in the mountains exceeding 12 feet, which made digging all the way to the ground an almost impossible task. The odd thing about this season’s snowdepth is, that it is almost as deep up at Togwotee Pass as it is in the Tetons. Normally, Togwotee might see only half or, two-thirds of what the Tetons have. Not so this year, it’s almost the same across the board. Temperatures most of the week were way below normal as well, starting the week (over Easter weekend) in the single digits in the morning at 10,000-ft. And ending the week with temps in the teens. On April 29th I got out of my truck on Togwotee Pass at 13 degrees at 10 a.m. and when I returned at 5 p.m. it had warmed up to 15 degrees! Winds at ridgetop level that day were a steady 30 with gusts to 50. Nice day. I have to say this was one of the best avalanche courses I have ever been a part of. It was an honor for me to be able to be out in the mountains with fellow meteorologists and share my knowledge of snow and avalanches with them. It was also an honor to be in the company of such a distinguished and unique group of servicemen. These guys are not just sitting in a weather office staring at a computer, they are deployed to places like Afghanistan and often have to put down the hand-held anemometer and pick up a gun to help defend our freedoms. I thank them for that. that would have been a time! I salute all you guys for the job you do, and if our paths ever cross again, as I hope they will, I will be the first to buy you all a round at the bar. Photo of the Team on Top of Glory Peak. Woody...Great job on training the troops! Thanks so much for doing this for some of our troops. One of those gentlemen you trained was my "little" brother. I am so glad that he is getting the best training so he can help others!